There’s a dizzying array of instant noodles available out there, as a trip to any Chinatown supermarket noodle section will prove. It’s all a matter of finding out which brand and flavour works best for you. After heartily recommending some inexpensive instant noodles (Ibumie Penang White Curry Mee -Peris Kari Putih) a few weeks back, I was contacted by my Facebook friend Mandom Hui who suggested that we cook some noodles together. Never one to turn down a new culinary adventure, we arranged a date for him to swing by my place and give me a 101 in instant noodle preparation, and oh my goodness, I was to discover that I had been doing it seriously wrong for all these years. I find these kind of eye-opening experiences most enjoyable, and don’t in any way mind showing my ignorance about any subject matter when under the tutelage of someone who obviously knows their stuff. My afternoon with Mandom cooking instant noodles was one of those wonderful moments. Up until this moment I had been making instant noodles in the laziest way possible. You know, the way that most people do it: Boil water, add noodles and sachet(s) of stuff and then serve. I’ve only once taken a foray into tarting my instant noodles up, but for the most part that’s exactly how I do it. 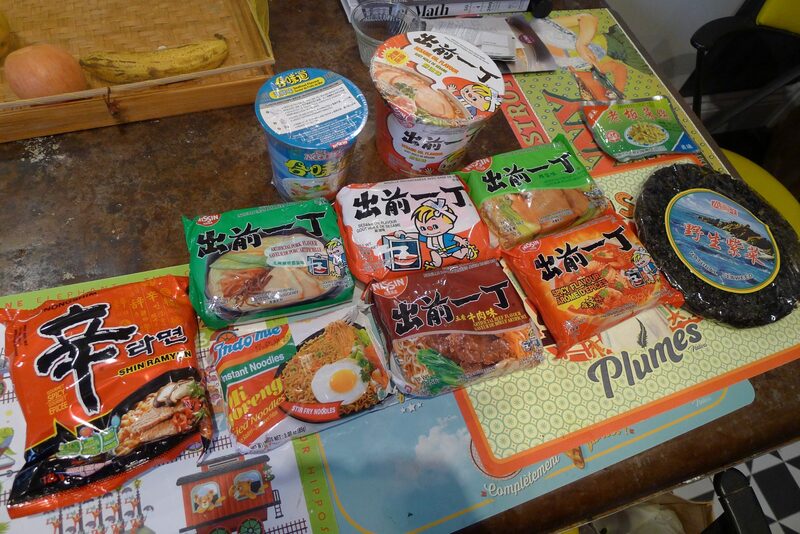 1: There are so many different brands and varieties of instant noodles on the market. As they are so inexpensive it is easy to experiment and find the ones that you enjoy the most. 2: Although in Canada we tend to think of instant noodles as junk food, in Hong Kong they are seen as more like Kraft Dinner, and when augmented make up an entire meal. 3: Not all noodle bowls are born alike, and the better ones have a raised bottom allowing one to pick up and hold even when full of hot soup. 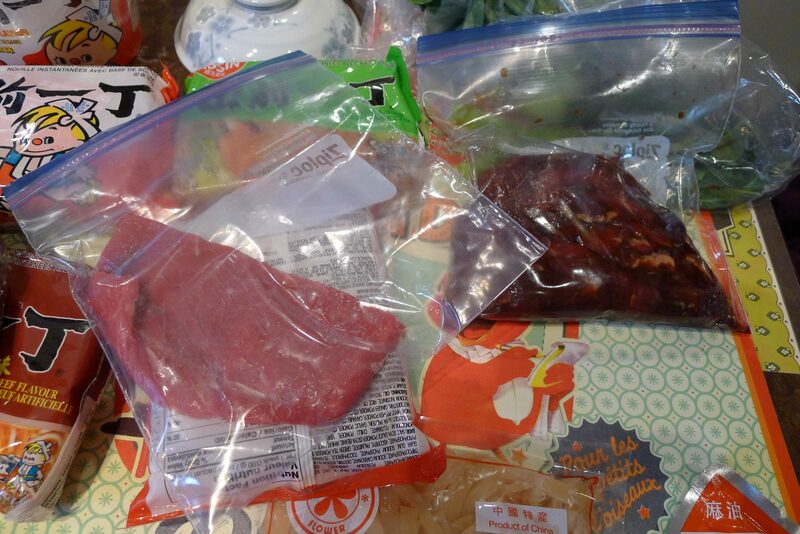 4: It’s a good idea to purchase some flank steak, cut into thin slices against the grain (they need to be thin enough to cook in the hot broth just before you pour over the cold noodles), and then put in a zip-loc bag with some light and dark soy sauce, a pinch of sugar, and finally some sesame oil. These strips will keep refrigerated for a week or so, and can also be quickly fried up for a quick and tasty snack. The same can be done with pork tenderloin. 5: Preserved vegetables are your friends. 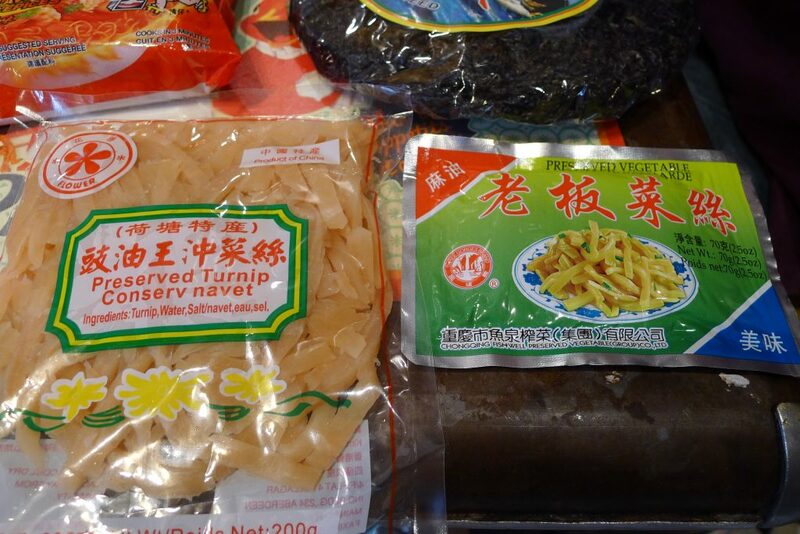 Cheap and with a long shelf life even after opening, preserved turnip and cabbage are really quite delightful. Just be sure to give them a good rinse first as they can be seriously salty. 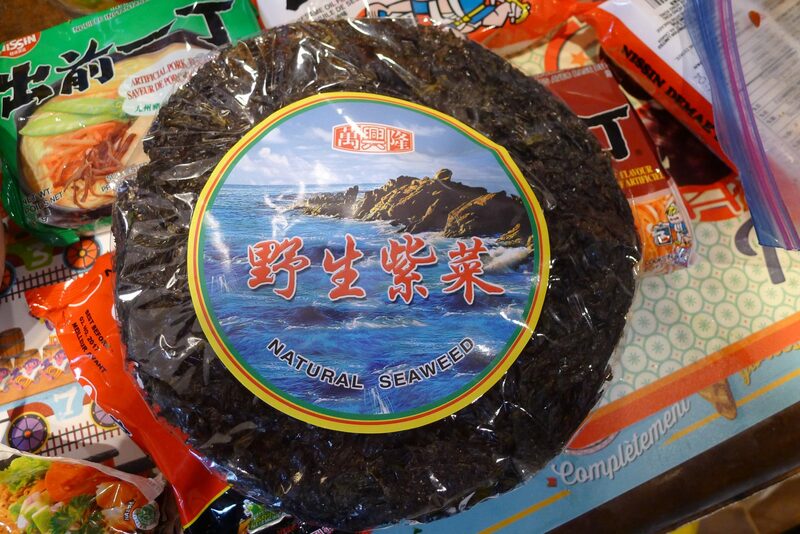 6: Another cheap addition to your instant noodles can be dried seaweed. Just remember that a little goes a long way, so be careful unless you want your entire dish to taste of seaweed. 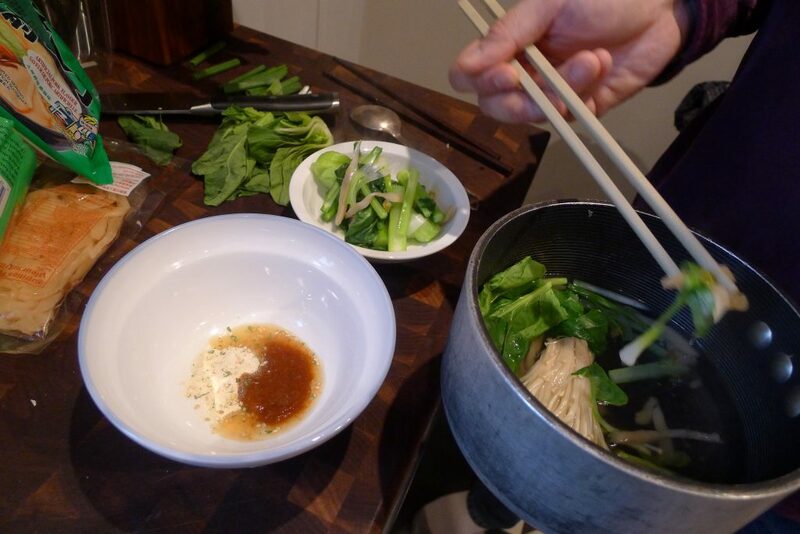 7: THE GOLDEN RULE – Always cook your noodles in a separate pot from your broth. It’s one extra step and you dirty one extra pot, but it makes a world of difference to the eventual outcome. If you actually go to the trouble of reading the instructions on the side of the packets most of them ask you to do this, and to rinse the cooked noodles in cold water once they are done. If you use the same water you cooked the noodles in you’ll find yourself with a murky, sullen, dull broth. If you cook the noodles and rinse them you’ll find your broth to be brighter, more flavoursome and aromatic, and your noodles with have quite a bit of a spring to them after their cold water bath. 8: Use your bowl to calculate the amount of water required for your pot of broth. 9: As you heat up the water for the broth feel free to add some greens, scallions, pickled vegetables, seaweed, and/or enoki mushrooms to add to the flavour of the soup. 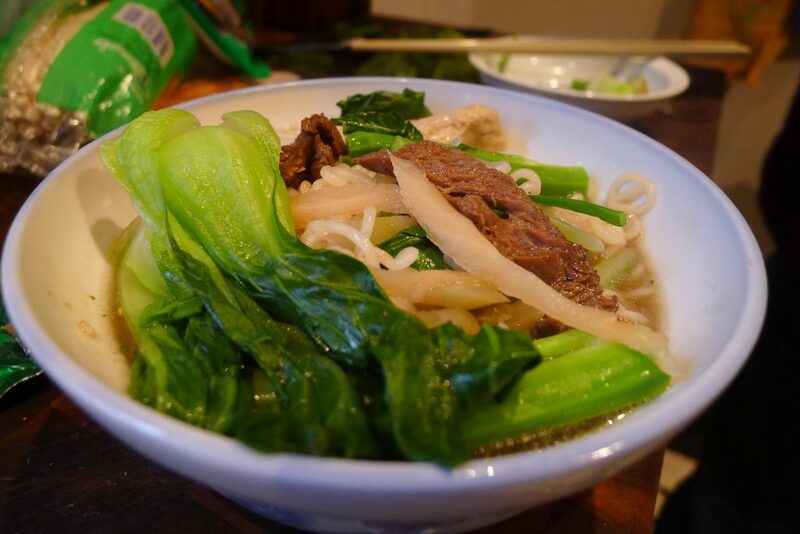 Chinese broccoli is particularly good for adding a lot of punch to the eventual broth. Add the beef/pork just before you pour the broth over the noodles and paste (see #9). 10: Place the contents of your flavour sachet(s) in the bottom of your serving bowl and add a few tablespoons of your hot broth liquid. Stir to “melt” and turn into a paste. 11: Many of these flavour sachets contain a shedload of salt, so if this really concerns you feel free to use half a sachet. 14: Once you have “melted” the sachets’ contents, place the cold cooked noodles on top of the paste. Now pour over the hot broth pot’s contents (greens, vegetables, seaweed, beef, mushrooms and all) to reheat the noodles. Stir and serve. 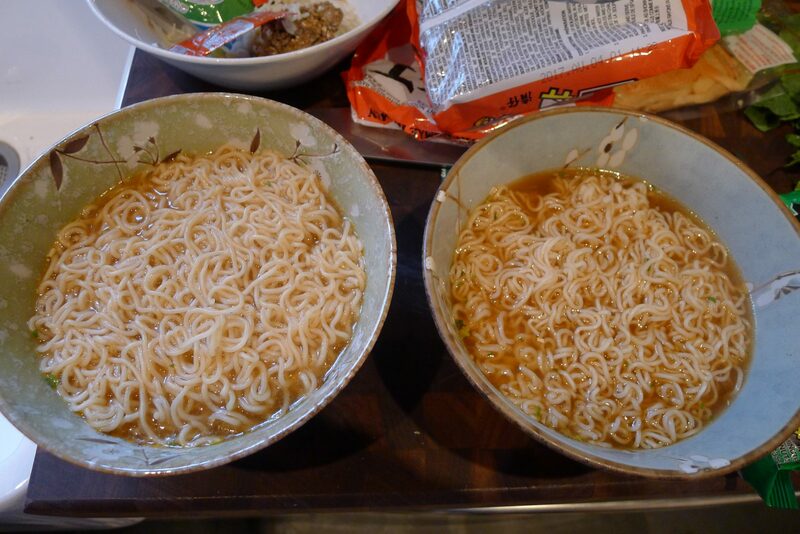 15: Give yourself a pat on the back for gussying up your instant noodles for the first time. 16: Mr. Noodles are utter rubbish. Don’t be cheap and spend that extra 40 cents on some decent instant noodles. My favourite would be the well-known Nissin brand. 17: Don’t read the ingredients list. Don’t ever read the ingredients. Ever. 18: It’s not unknown for Hong Kong families to have drawers completely stacked with loads of different types of instant noodles. I’ve been stockpiling them myself. And they last forever… probably something to do with those rather questionable ingredients. 19: Pretty much anything that is left in the fridge is fair game. 20: Fried cubed spam is a particular favourite addition. Great Wall brand being the best to track down as it’s quite a bit fattier. Preserved turnip and cabbage. A tasty, inexpensive, and long lasting addition to your instant noodles. I’d recommend rinsing them for a bit before adding them though as they can be pretty damn salty. Another nice touch is crumbling up a small piece of this inexpensive dried seaweed, although be aware that even a little goes a long way. 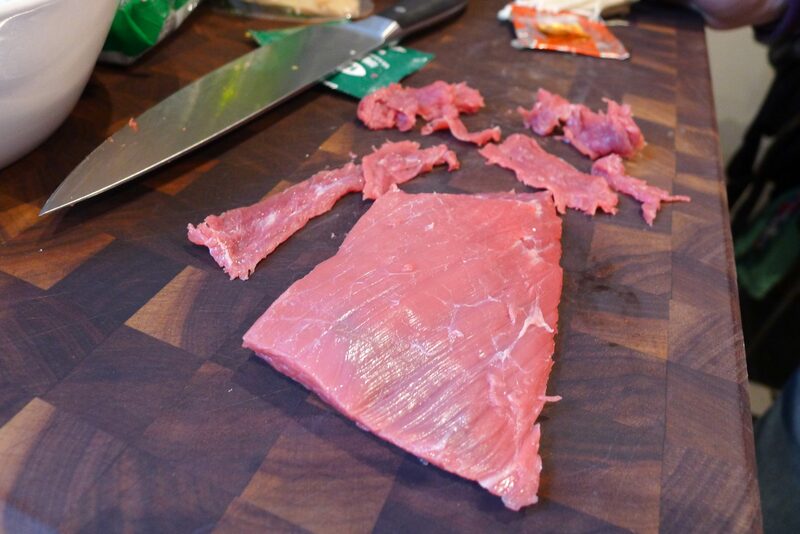 If you are looking for a meat component, there are few meatier additions than some thinly sliced flank steak. On the right you can see some sliced and marinated in light and dark soy sauce, sugar, and sesame oil. Add the sesame oil last as otherwise it will coat the meat and prevent the other ingredients from penetrating the meat. Keeps for around a week in the fridge, and is very handy for a quick midnight snack. Slicing the flank steak against the grain into thin slices that will cook quickly in the broth. A Tale Of Two Broths : On the left the murky broth that comes from using the same water that the noodles are cooked in. On the right we have taken that extra step with the noodles and used an extra pot of water to make the broth. “Melting” the flavouring sachets and taking the greens and mushrooms from the broth pot. The end result : certainly a few notches above the usual bland instant noodles I have been known to make previously. 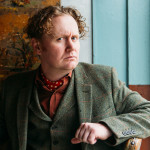 Edinburgh-born/Toronto-based Sommelier, consultant, writer, judge, and educator Jamie Drummond is the Director of Programs/Editor of Good Food Revolution… And he’ll never look at instant noodles in the same way again.